Car crashes into classroom killing student who switched seats. Home Scandal and Gossip Car crashes into classroom killing student who switched seats. Lacey Gruntorad. Death doesn’t discriminate…. A Pima Medical Institute student went on to meet an untimely freak death after a car crashed into the classroom killing her. She had only moments before switched seats to be closer to the lecturer. 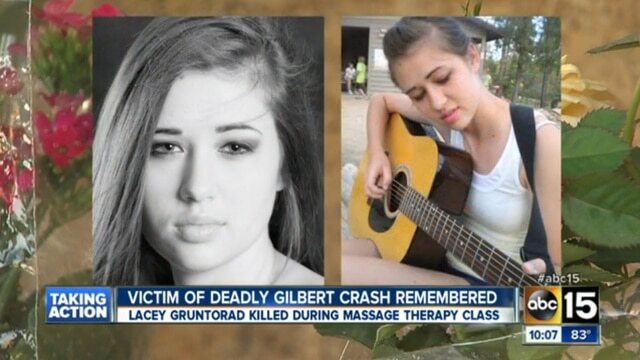 At the time the 22 year old student, Lacey Gruntorad had been attending a massage therapy class when on September 27th a white 2002 Infiniti luxury sedan suddenly rammed through the wall and ran her over. Her instructor Melinda Keeling went on to suffer a broken arm, while another student sustained back and leg injuries. Twelve other students had minor injuries that were treated at the scene. According to authorities, Gruntorad had approached a classmate during a break in the session and asked to switch seats. Gruntorad had wanted to be close to Keeling so that she could use her as a volunteer during a demonstration of massage-therapy techniques. The student who switched places with Gruntorad escaped the crash with superficial wounds. Yes kids, life is brutal, literally and metaphysically. The car’s driver, an 87 year old woman, went on to tell she confused the gas pedal with the brake and lost control of the vehicle. No criminal charges were brought against the 87 year old driver after a panel of experts ruled the accident was neither reckless, negligent, nor intentional. Usatoday goes on to tell the 87 year old driver has since the accident been consumed by anguish and told of suicidal statements.